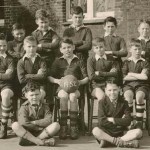 Posted 9 October 2013 & filed under 1960s, Life and leisure, Schools, Sport. St Peter’s school in Cottonmill Lane is by far the oldest school in Sopwell. 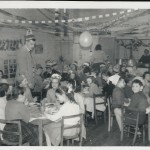 It started off as two schools, a church school for boys and girls over seven and a school for infants from two to seven. The building was situated originally on Old London Road where the Priory Park complex is now. They were built between 1850 and 1851 on land granted to the schools by the Earl of Verulam. 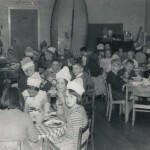 St Peter’s Infant School occupied one large room at the west of the old building. The church school was an adjacent room about 40 feet by 20 feet. Both schools opened on 29th September 1851 and soon had 120 and 160 children on the registers. 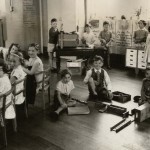 The staff in each school consisted of a mistress assisted by pupil teachers and monitors. A child could become a pupil teacher at the age of thirteen, and receive tuition from her mistress while teaching for a maximum of 25 hours per week. Children served a five-year apprenticeship as a pupil teacher. In 1872, there were about 130 infants in the one room without dividing partitions or curtains. Boys in the church school were transferred to Christ Church School in Verulam Road in January 1893. Later on, in 1901, another school was built for the senior pupils. Called Priory Park, it was built alongside the eastern end of St Peter’s. St Peter’s later became a Church of England primary school and Priory Park became a senior girls’ school. 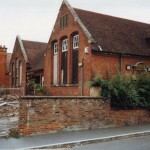 St. Peter’s ceased to be a Church of England school after the second world war and became a County Primary. Shortly after that, in 1953, St. Peter’s took over the Priory Park building when pupils from that school were sent to St Julian’s Secondary School (now renamed Marlborough School) in Watling Street. The land on which the present school is situated used to be allotments until well after the war. 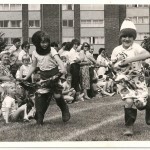 The site was acquired in 1968 and the school moved into the present building in Cottonmill Lane on 31st January 1975 and the new nursery department opened on Monday 3rd February 1975. Many residents have memories of attending St Peter’s on the old site. The following is from Peter Gould who the headteacher from 196-65. 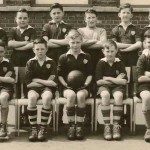 ‘When I became Headteacher of St Peter’s in 1960, aged 33, I was the youngest member of staff. Just after the new term began, the deputy head had an attack of Bell’s palsy and the music teacher, Mr Rawlins, broke his arm and so both were absent. I scoured St Albans and managed to find one replacement teacher but I had to take a class full time myself for a few weeks, whilst managing everything else and getting to know the school! However, the staff were all wonderfully supportive – whilst I was careful not to be a “new broom sweeping clean”. 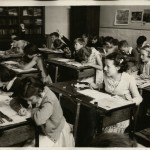 St Peter’s had been a girls’ secondary school immediately after the Education Act but with Hertfordshire’s extensive post-war population explosion and consequent building programmes, the school had become a JMI. The building in Old London Road, was Victorian with many nooks and crannies and two playgrounds but no playing fields although the football field was near the old Sopwell Nunnery a short walk away. We were also able to use the old outdoor swimming pool in Cottonmill Lane nearby. Most of the children lived in the immediate locality and about 25% were of non-British origin. Only about 5% were from professional or middle-class backgrounds. I made clear to the staff that my first objective was not to update the old curriculum but to create the kind of social atmosphere in which mutual respect between staff and children would form a basis for learning and change. So there was great insistence of politeness and well-controlled classrooms. In time this objective was achieved and visitors frequently said what a nice atmosphere we had all created. I had been on several courses at Herts County Council and began to update the maths and reading schemes, replacing Nature Study with more exciting Junior Science. I based my lessons on ideas from the UNESCO Book of Science Teaching – intended for developing countries! Nearly all the equipment came from everyday items in the home and the children enjoyed collecting materials for frequently messy lessons. 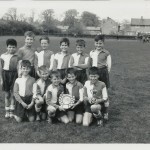 Although a small school we had a good football team coached by George and we won the 5 a side cup. 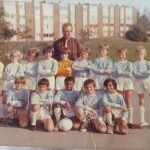 One of the team, John Mitchell, went on to play for Fulham and played in a Cup Final, although on the losing side. Later in his career he became manager of St Albans FC. At St Peter’s I renewed my link with the Herts School Sailing Association and we built an Enterprise sailing dinghy in a temporary classroom in the playground. The timber was provided cheaply by the husband of one of an old colleague of mine at Brunswick Park School in London, and the building and the building frames were donated by a fellow member of the Herts SSA. My brother in law, also a teacher, made many of the metal fittings in his school workshop and the boat was built for approximately £100 plus sails. Two boys from the school worked enthusiastically on the construction, Andrew Daykin and Dougie Taylor. Andrew was the son of one of my regular supply teachers, Elizabeth Daykin, a cultivated English graduate and excellent pianist. We took some of the school children and the boat for training at Cheshunt Sailing Base and to Bury Lake at Rickmansworth. Between 1960 and 1964 I regularly took groups of school children to Cuffley Camp and to the Herts Sailing Camp on the Norfolk Broads. 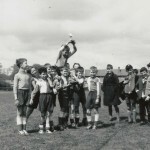 Les added two photos of the St Peter’s school football teams in the 1950s. I noticed a comment from Les Meaton he is my mother’s cousin I wonder if anyone knows how I can contact him. Diane Carvill,Carol Barnes, georgeous looking Lorrain who lived up the hill from The shepherds, Roy shepherd,Michael Savige. After St Peters I went on to Townsend ,and unfortunately lost contact with friends . I actually married a guy from old London Road that used to go to the after school Gym that St Peters ran.Great School and many many fond memories . Miss Ermston was My first Teacher ,I remember fondly miss or Mrs Rodgers ? and scary Mr Stickland ,Strickland. On my last visit to St albans I visited the old school site which brought back so many fond memories. I lived in Priory walk up untill 1964 when I came to live in Australia.My Late Husband was Denis McAuley from Old London Road. Glad it brought back memories for you Ann! Thank you Sandy, one never forgets their home. I recognise myself in the Christmas photo, Jeff Mattison, along with a couple of my close friends, Michael Fuller and Ken Hounslow. 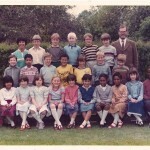 Would be interested to know if anyone out there recognises other old school friends? My sister found this place and i could not believe it. I live in USA now but i have tried many times to find something but never never did. I would love to find even more but the christmas photo was amazing. i would like to know my people to remember.I’m going to read all about more now.I remember about the strickland..we all hated him. Glad you like it Jeff! Great to hear from you and I’ve dropped you a note under sperate cover. Jeff..how do i find to see the seperate cover? I emailed the note via your email address. I have been working painting on my home right now but when finished i’ll talk a lot.I’m not if you are trying to saying anything this not on the sopwell to recive anything.Can you please send an email name. Hi Jeff.I’m not sure if you remember of this kid on the left side table….you know him.Well this person ruined my life during the St Julians school.I would like to talk to him as he is a man know…i have tried to find him on chat channels but no luck, i would fly to england to meet him again. I will tell you later since i would not talk about this on the Sopwell chat cause it would be hard to talk like this. Jeff..i have received nothing on my email? I would like to talk more if these are so long.You remember how we used to mess on the massive coal area then they would come after the workers from us. Like i said my reading is not as it was after my stroke and i had to talk all over again just like a child….funny.Did you find anybody else? Do you know how we can send some photos around here. 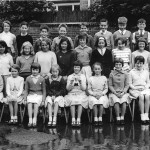 Started primary school in 1959 at Pemberton but had a bad experience there. Not sure the teachers were entirely interested in kids. St Peters was an entirely different experience. The headmaster was amazing and the music teacher a real gent. The most amazing was Mrs Edwards, restored my faith in humanity. Happy times and then on to Beaumont another great school. St Peter\'s School 51.746350, -0.335365 Any text can go here, even links but best not put too much because the space in the popup balloon is limited, especially when viewing a small map in the sidebar. Note: I am deliberately exaggerating here, to prove my point. 1. Map showing a layer, the Schools layer in this case. 2. Map showing a multi-layer map that combines the Schools and Churches layers. Sadly, unless I am missing something, the end-user does not get control over which layers to display, even though the underlying leaflet.js engine does have the functionality required.